After attending University of Toronto where he studied Physics, he went off to Cambridge, England. It was at Cambridge that he met Douglas Mawson, who had recently returned from Shackleton's Nimrod Expedition (1907–09). Like most of Scott's party he was a scientist and carried out many experiments, traveling, on foot, great distances. He also was part of the larger team that first set out with Scott on November 1st, 1911, to the south pole. However, while traveling with Scott for some considerable distance, Wright was not chosen to be one of the team with Scott in the last stage to the Pole. 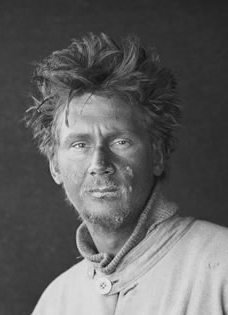 On December 22nd, at the glacier summit, with still 300 miles from the pole, being part of the first supporting party, having pulled through the snow and ice for seven weeks, Wright was ordered by Scott to return. His party then navigated the 580 miles back to Cape Evans, apparently with out incidence. On 12 November, 1912, it was Wright, as a member of the 8-man search party led by Edward Atkinson, who first spotted the tent containing the bodies of Scott, Wilson and Bowers. As did the majority of the surviving explorers who were with Scott in the Antarctic, Wright went off to fight in the First World War. Indeed, Wright went on to assist the British efforts during the Second World War being involved in the development of the radar system and in the development of devices to detect magnetic mines and torpedoes. After the War he went to the United States to lend his expertise in Oceanography and other areas of study. He came back to his native Canada in 1955 to join the Pacific Naval Laboratory. In 1967, Wright joined the Institute of Earth Sciences, based at the University of British Columbia and Royal Roads Military College, Victoria, British Columbia. At the age of 82, Wright finally settled down; he lived out the balance of his life on Saltspring Island, British Columbia.